Radio artists, geeks, and activists are converging on Helsinki for particle / wave. Bringing extraordinary ideas of how to make radio, they will be giving the city a new soundtrack, and invite you to mix it. Particle/Wave will be happening on air, online, on the street and even on your phone. During recent years we have seen creative radio disappear from stations around the world while at the same time net radio, podcasting, mini fm transmission, pirate radio and hybrid wireless projects have boomed. It’s the future of radio and it’s going off with a Bang (Click! and p.o.p) at Particle/Wave. particle/wave fosters points of contact between radiomakers working in traditional and emergent ways. by bringing together radiomakers from a diverse array of practices to exchange skills and perspectives on radio art and technologies and cultures of radiomaking from across public, community and independent net and participatory radio. The workshop takes an approach that maximizes active engagement and collaboration amongst participants and with audiences and avoids passive consumption of information. In this way we aim to build lasting networks and collaborations as well as rich learning exchanges. Our commitment to process based practices and flexible infrastructure mean that all systems and schedules are open to change and development. Open discussions on current themes in experimental radio… find out what all the noise is about. As part of pixelACHE’s dot.org.BOOM, you can get the latest in do-it-yourself radio and meet the people who are rewriting the rules. The morning will be focused on rapid skills exchange and sharing production practices for getting out on the streets and making radio together. The afternoon themed discussions will be streamed to the remote participants, with irc chat projected in the seminar room to feedback into the conversation. The workshop explores a number of themes which stimulate a critical interface between tools, production practices and creative philosophies. Many participants bring projects that actively engage with the radiophonic past to reinterpret important radio repertoire for hybrid networks. We look at the changing contexts of radio pratices over time, and foster a dialogue between different forms of radio, exploring what is and is not new about working with recent technologies. A number of radio artists are making their own software to address the potentials of new networked practices of collaboration. 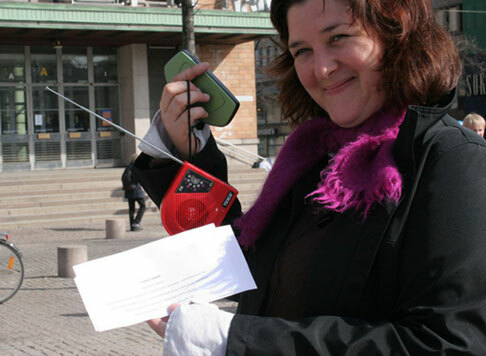 Participatory radio based on shared tools requires shared sound materials. This project explores how open content, which is exchanged for free, and open tools impact on production processes and economics of supporting radio art. When broadcasting breaks free of the studio, and we can make radio anywhere there is internet access or a telephone; it changes the frame of reference for a shared simultaneous experience. For example, UserRadio by August Black is an elegant tool for collaborative mixing from anywhere that participants can access a web browser. Working with an entirely temporal mode such as sound, shifting notions of ‘realtime’ invites fresh approaches to the local and temporal. As radio moves into the ‘packets and bits’ environment of the internet there is also an increasing awareness of the physical nature of radio waves as a medium with their own fascinating characteristics. Far from cherishing a nostalgia for terrestrial broadcast, artists such as Adam Hyde have developed a deep appreciation for the radio spectrum as a rich environment with an ecology of it’s own. Other artists take up the electromagnetic environment at a very local level. By fieldwork we mean a range of sound gathering and distribution practices that situate the listener in a soundfield, or integrate a broadcast into a community of listeners, or simply explore the local field of operations from a sonic perspective.